I love to recycle stuff I found at the thrift store. So I decided to make a small side table from a briefcase! It took me a long time before I figured out the combination of the lock, but in the end I was able to open it. For the legs I used a small footstool. I really love how this briefcase sidetable turned out! 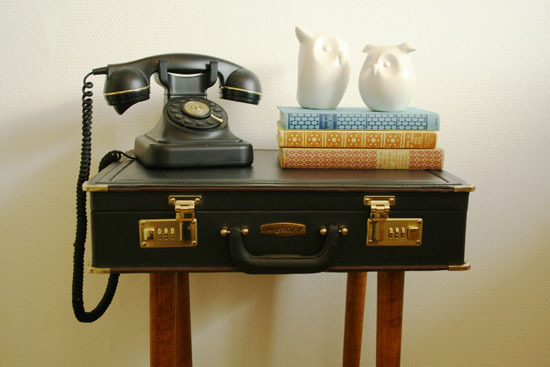 Learn how to make this briefcase sidetable after the jump. . . Saw the legs from the footstool. Decide where you want the legs to be under your briefcase. Put the wood inside your briefcase and screw the legs under the briefcase. The wood inside the briefcase makes that the legs are extra secure. That’s it!